Dr. Julian asserts that this is a false attribution. 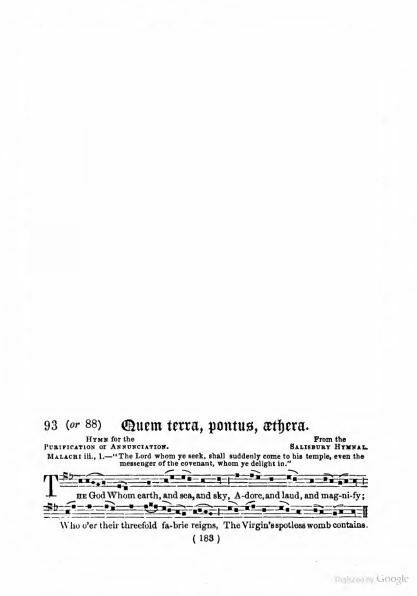 Sheet Music from Sheet Music from Joseph Mohr, S.J., ed., Cantiones Sacrae: A Collection of Hymns and Devotional Chants. (Ratisbon, New York & Cincinnati: Frederik Pustet, 1878), #111, p. 263. Sheet Music from Rev. John Mason Neale and Rev. Thomas Helmore, eds., Hymnal Noted, Part I. (London: Novello & Co., 1852), Part II (London: Novello & Co., 1856), #93, pp. 183-184. Sheet Music from Thomas Helmore, Accompanying Harmonies to the Hymnal Noted. Part I (London: Novello, Ewer and Co., and Masters and Son, 1852), Part II (London: Novello and Co., Joseph Masters and J. T. Hayes, 1858), #93. 1 sidera. This change was made by Pope Urban VIII in 1632 to the Roman Breviary. This hymn was composed by Venantius Fortunatus (530-609), Bishop of Poitiers, and has been an important part of devotions to the Blessed Virgin Mary since the early Middle Ages. Today it is used in the Little Office of the Blessed Virgin Mary daily as a hymn for the Office of the Readings and also as the hymn for Friday Lauds. In the Liturgy of the Hours it is found in the Common of the Blessed Virgin Mary as the hymn for the Office of the Readings. There is a second part of the hymn which is used as a hymn in its own right, O Gloriosa Domina. This much longer version was found in A. S. Walpole, Early Latin Hymns (Cambridge at the University Press, 1922), Hymn 39, pp. 198-200.
uentris sub arca clausus est. From the Liturgia Horarum [Liturgy of the Hours]. This is the standard form of the hymn as it is used liturgically. However, there is another verse to the hymn which falls between the second and third verses above. It is as follows: Mirantur ergo saecula,/ quod angelus fert semina,/ quod aure virgo concipit/ et corde credens parturit. There is a second part of the hymn which is used as a hymn in its own right, O Gloriosa Domina. The translation is by J. M. Neale (1818-1866) except for the last two lines. His original lines were: "All glory, as is ever meet / to Father and to Paraclete". 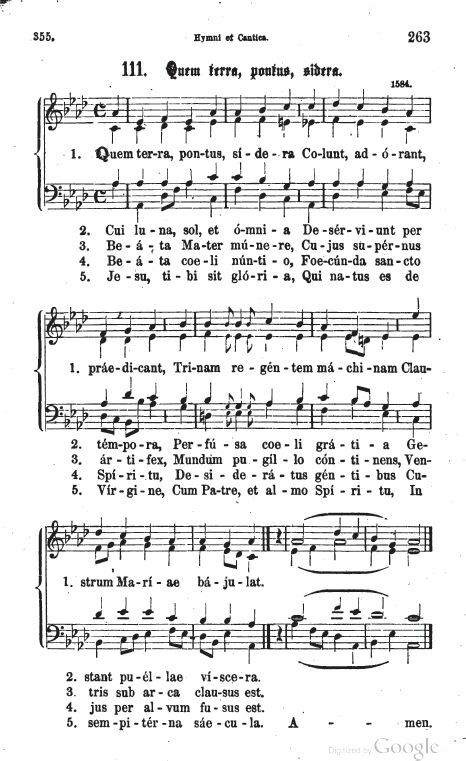 Both hymns are popular Marian hymns used in the Liturgy, Quem terra, pontus, aethera being used for the Office of the Readings and O gloriosa virginum being used for Lauds in the Common of the Blessed Virgin Mary. The hymn was a favorite of St. Anthony of Padua. Tradition has it that it was sung by St. Anthony's mother when he was an infant. It was such a favorite of St. Anthony, that it was constantly on his lips during his life and he sang it at his death. Note from John Julian, ed., Dictionary of Hymnology (1894), pp. 944-945. Quem terra, pontus, aethera [sidera]. [Purification of the B. V. M.] This has been frequently ascribed to V. H. C. Fortunatus, and is included by F. Leo in his ed. 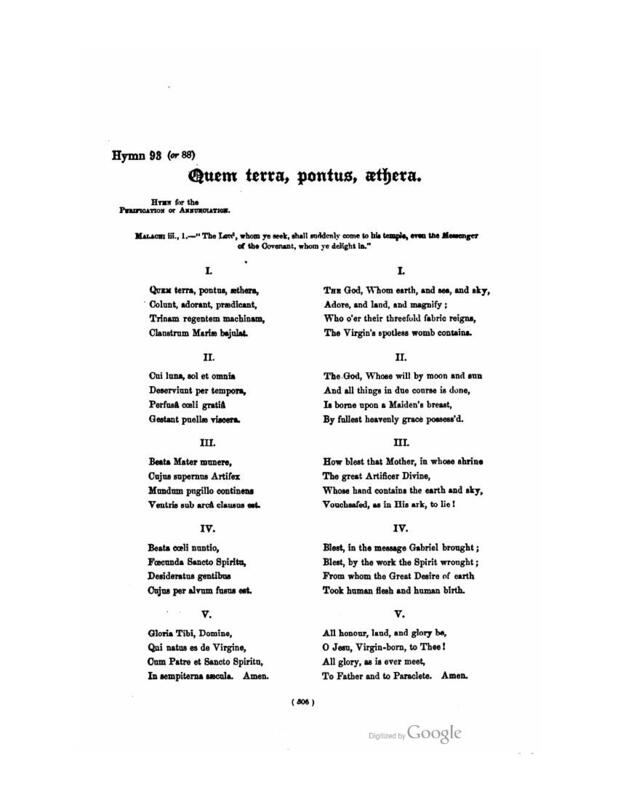 of Fortunatus's Opera Poetica, Berlin, 1881, p. 385, but among the hymns falsely attributed to him. It is found in four MSS. of the 11th cent., in the British Museum (Jul. A. vi. f. 38 b ; Vesp. D. xii. f. 61b; Harl. 2961 f. 231; Add. 30848 f. 55 b); and in the Latin Hymns of the Anglo-Saxon Church, 1851, p. 74, is printed from an 11th cent. MS. at Durham (B. iii. 32 f. 22). It is also in the St. Gall MS., No. 387, of the 11th cent. Mone, No. 419, cites it as in a MS. of the 9th cent, at Admont. The second portion, "O gloriosa femina, Excelsa super sidera," is often given as a separate hymn, sometimes beginning "O Gloriosa Domina," as in a 12th cent. MS. in the British Museum (Harl. 2928 f. 120 b); in Mone, No. 420, and in G. M. Dreves's Hymnarius Moissiacensis, 1888, p. 38, from a 10th cent. MS. In the Roman Breviary, 1632, the first part begins Quem terra, pontus, sidera, and the second part O gloriosa virginum. 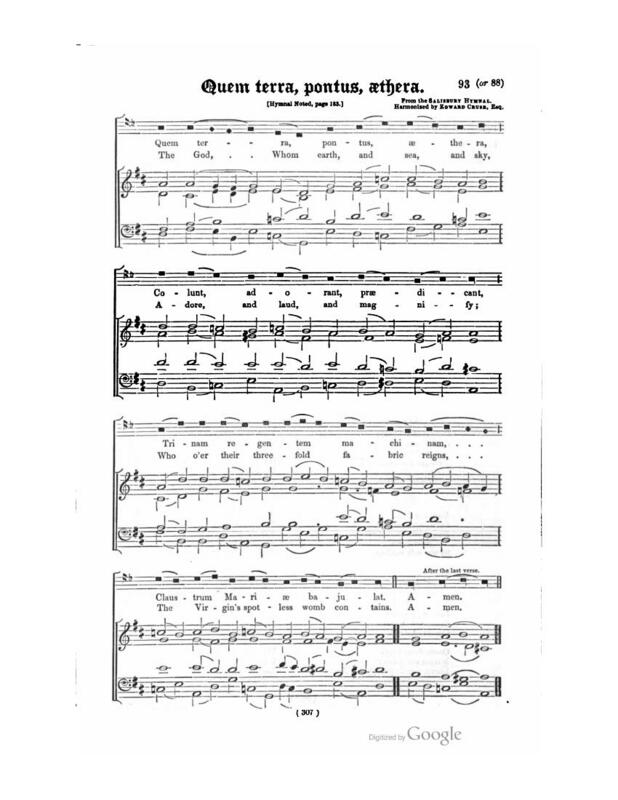 The full original form of this hymn has not been translated. We have the following forms in English. The God Whom Earth, And Sea, And Sky, &c. J. M. Neale, in the Hymnal Noted, 1854 ; H. A. & M., 1861 and 1875; the People's Hymnal, 1867; the Hymnary, 1872, and others, and sometimes with alterations. It is more extensively used than any other translation of this hymn. 1. The gouvernoure of the tryple engyn. Sarum Prymer, Paris, 1538. 2. Whome earth, and sea, and eke the skyes. Primer, 1604. 3. He whome the earth, the sea, and skie. Primer, 1615. 4. Lo, He Whom Earth, and Sea, and Sky. J. D. Chambers, 1852. 5. Whom earth, and sea, and air. W. J. Blew, 1852 and 1855. 6. The God whom earth and sea and sky Revere, adore, &c. J. D. Chambers, 1866. 1. Him Whom the Skies, the Earth, the Sea. By Bishop Mant, in his Ancient Hymns, 1837, p. 48. 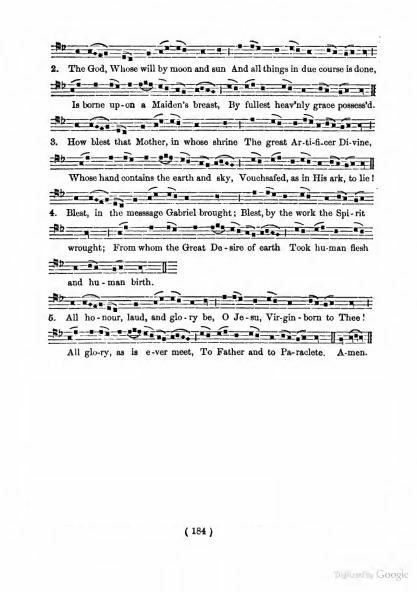 It is given in several collections, including the English Hymnal, 1852, and as "Whom earth, and sea, and sky," in the 1861 ed. of the same. 2. The Lord, Whom earth, and sea, and sky. By E. Caswall, in his Lyra Catholica, 1849, p. 199; and his Hymns & Poems, 1873, p. 106. In a few collections. 1. He Whom the Land, the Sea, the Sky. Primer, 1685. 2. The Sov'raign God Whose hands sustain. Primer, 1706. 3. Whom earth, and sea, and stars, and light. W. J. Copeland, 1848. 4. Whom earth, and seas, and heaven's high frame. E. Campbell, 1850. 5. Him we sing, Whose wondrous story. H. N. Oxenham, 1854. 6. The earth, the sky, the mighty ocean. J. Wallace, 1874. 1. O glorious Virgin, ever blest. By F. R. Littledale, pub. in the People's Hymnal, 1867, with the signature "F. R."
2. O glorious Lady, throned on high. In the Antiphoner and Grail, 1880, and the Hymner, 1882. 1. Glorious Lady, stellyfyed. Sarum Prymer, Paris, 1538. 2. O Lady set in glorie great. Primer, 1604. 3. O glorious Lady, Queene of might. Primer, 1615. 4. How glorious, Lady! is thy fame. J. D. Chambers, 1866. O Queen of all the virgin choir. By E. Caswall, in his Lyra Catholica, 1849, p. 200 ; and his Hymns & Poems, 1873, p. 106. In the 1863 ed. of the Appendix to the Hymnal Noted, it is altered to "Most glorious of the virgin choirs." 1. O Glorious Virgin, thron'd on high. Primer, 1685. 2. O Mary ! whilst thy Maker blest. Primer, 1706. 3. Eternal glory of the skies. Bishop Mant, 1837. 4. O Mary, how great is thy glory. J. Wallace, 1874.